It takes some kind of chutzpah to write a full-length book about your own mother's infidelity. And a towering sense of equanimity to do so positively, openly wishing your mother had married the man she dallied with for sixteen years instead of the presumably lousy second husband who is barely named. But Bill Griffith has both of those things -- and, on top of that, a much better ability to control and shape a complex book-length story than one might expect from the cartoonist behind Zippy the Pinhead for the last few decades. Invisible Ink is billed as "a graphic memoir," but it's more about Barbara Jackson Griffith -- Bill's mother -- and Lawrence Lariar, the cartoonist she had an affair with from 1957 to 1973. Bill tells the story, and organizes it -- like so many Zippy sequences, this is the story of the "Griffith character" looking at things and thinking a lot about them, though he lets himself be more grounded and less neurotic than his usual Zippy persona. (It helps that he's not trying to set up a punch line every four panels here, of course.) Bill, or his cartoon avatar, is our guide, and the one who uncovers the story -- but the core story is about Barbara and "Mr. Lariar," as she always called him. Along the way, we learn that Bill's childhood was not all that happy -- he and his sister Nancy were both regularly beaten by their tightly-wound father (even before their mother's long affair, in case anyone suspects a cause-and-effect relationship), though Bill hit back at age eleven, and that seems to have stopped the abuse for him, at least. That father, Jim Griffith, stays a distant, cold, unpleasant figure throughout the book; he was young and happy once, but that curdled when the two children were young and didn't lift until his unlikely bike-accident death in 1972. Bill wasn't thus super-close to his mother, either -- it looks like one of those chilly WASPy mid-century families, where the kids play outside and far away as much as they can to stay away from the parents that much longer. Barbara told Bill about her affair right after Jim died -- Bill was in his late twenties then, but, still, it's an unusual thing to tell even an adult son about a long-running affair. The affair was just about to break up then, as Griffith shows here: Lariar was married, and didn't want to break that marriage for the newly-free Barbara. But Barbara wanted a solid relationship, one that encompassed her whole life, and wasn't willing to stay the woman on the side once her own husband was gone. So Lariar broke it off, and Barbara married that barely-mentioned second husband a year later, on the rebound. Invisible Ink is a deeply humanist book, full of thought and wisdom: it's the book of an older man looking back at several lives (his own among them) and seeing the things that could have gone better. 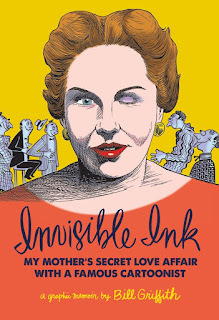 There's a wishful tone in places, but more often an inquisitive spirit: every life has secrets, and Invisible Ink is the story of Bill Griffith delving into the deepest secrets closest to his own life and coming to terms with what he finds out. Actually, "coming to terms" is too strong -- Griffith already accepts all of it; there's no anger or disbelief here. He just wants to understand and to know -- and, along the way, he presents it all for us, written thoughtfully and drawn compellingly.